Somehow, amazingly, we've brought our fourth child home. Hudson arrived last week. Kortney really did the hard part, leaving me to pick up the moral support (can't say I'm the best at that). Our first 24 hours with Hudson were great - he barely cried, slept in nice big chunks, and mostly just let us ogle him and laze around. Day two was quite a big different - sleep all day and party all night. After about a week he seems to be settling in. I'm not sure what Caleb thinks yet. Kiera will occasionally put her head on Hudson's or try to give him a hug. Micah couldn't care less and has barely acknowledged him. Nights long. Days are long. We're on our way to bring our son home. Two years after we began our adoption process, we're nearing the end. Kortney and I are both beside ourselves. We're so excited to finally meet this little boy who we've grown to know through pictures and videos over the last fifteen months. I'm really excited to be a dad. I don't know if I'm going to be a good one or that I know what I'm getting myself into, but I'm ready to find out. I'm looking forward to playing, teaching, caring for, and protecting our little man. I hope I can be someone he looks up to. I've changed hohle.net to grey in support of my brother-in-law, Troy Gray. Troy is an inspirational, dynamic guy who has poured his heart and soul into his family and teaching the youth of Tempe, Arizona about Jesus. Troy has been battling leukemia since the summer and at the moment it looks like his cancer has the upper hand. Kortney and I are aching for him and his wife and children. We are praying continually for Troy, Kelly, and their two beautiful kids who need their dad. We appreciate any time you can spend praying for him as well. The first computer I had growing up with an Apple //c with a color monitor, tri-color ribbon printer, and an external 5�" floppy drive. I used the computer to play games, write papers, draw pictures, make banners and birthday cards (with The Print Shop). I even learned to write simple programs using the built in BASIC interpreter and the Apple II Basic Programming Manual. While I always had an interest in computers, it really wasn't until high school that I thought I might pursue a career in programming. I fell away from Apple computers for several years, but when faced with the opportunity to get a new laptop in 2003, jumped at the opportunity to get a Titanium PowerBook. I was a heavy Linux user at the time and thought having a commercially supported UNIX would be interesting. What I didn't realize was OS X would become my operating system of choice. Earlier that year I also picked up an iPod. This was when iPods still used FireWire cables, had hard drives (5GB! ), and grayscale screens. It was brilliant. My previous CD+MP3 player could store about 10 hours of music on a CD, but this iPod could store all of my music. 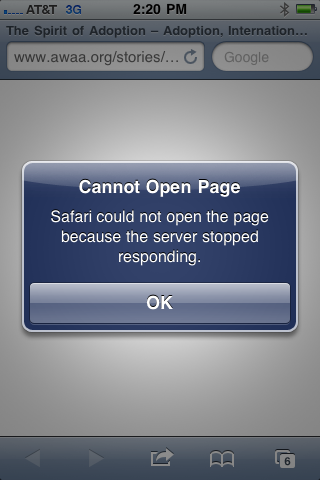 Since then I've become an avid iPhone user and written software for Macs, iPhones, and iPads. We've had more iPods in our house than people and currently have four Macs for just the two of us. A trip to the mall meant a trip to the Apple store, whether or not we were in the market for new gadgets or not. It was always exciting to see what Apple would announce next, and powering it all, a magic polish which made everything insanely great. And behind it all, Steve Jobs. He brought Apple back from irrelevance into not only the biggest company, by market cap, but also one of the most engaging, opinionated, detail oriented, and customer focussed companies in America. It's sad to think there will never be another Jobs keynote. We'll never hear "BOOM! ", about "magical" new features, or "one more thing" again. And at the same time, the sorrow of his death should be a catalyst to seize life and remember that "all external expectations, all pride, all fear of embarrassment or failure � these things just fall away in the face of death, leaving only what is truly important". In Jobs' now famous 2005 commencement address, he states, "[Death] is life's change agent. It clears out the old to make way for the new." Sometimes we're not ready for that change, though. But that change is inevitable and we must accept it or be paralyzed by it. This summer we were shocked by the sudden discovery of advanced lymphoma in my brother-in-law. In a matter of weeks, he went from leading teenagers at Young Life camp to a medically induced coma. He's now in the process of recovering, but events like this shouldn't be necessary to shake us into an awareness that we can all do so much more. 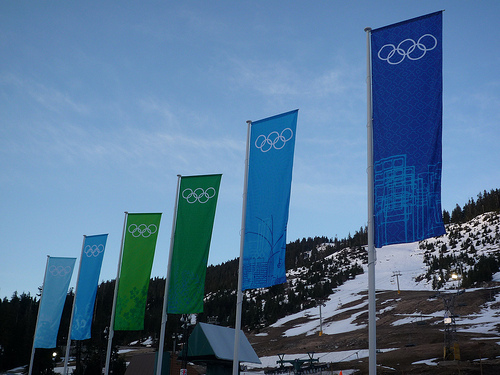 Last weekend Kortney and I went up to Vancouver to see a few events at the 2010 Winter Olympics. We drove up Friday afternoon, slipped across the border with only a few cars in front of us and headed downtown for the evening. We checked into the Corkscrew Inn, a cute bed and breakfast in Kitsalano, about 20 minutes by bus to anything we were interested in seeing. After a small complication with our tickets, we roamed around the pedestrian areas that had been blocked off, and watched the opening ceremony while we dined at the Glass City Caf�. Later on we happened across Wayne Gretzky carrying the Olympic torch in the back of a pickup as he was transported to the cauldron. Vancouver is dressed in Olympic garnish from head to toe. The signs and banners are all consistent, vibrant, and very well designed. All of the volunteers are uniformed in the same coats, hats, and occasionally snow pants. It was really impressive to see such a large city with such homogenous decoration. Saturday morning we headed to the University of British Columbia to watch Sweden and Switzerland compete in women's hockey. Kortney and I rooted for the Swiss, but it was for nothing; Sweden shut them out 3-0. We headed back downtown and strolled through Chinatown, Gastown, and finally to Granville Island where we watched women's freestyle moguls while eating at Cat's Socialhouse. The Canadians were thrilled when they took the lead, and disappointed, but good spirited when we took the gold from them. Finally, on Sunday we went up to Cypress Mountain to watch men's freestyle moguls. This was the highlight of the trip. We spent 4 hours, outdoors in the low 30�s, but enjoyed the entire time (except the hour+ waiting in the concession line). The crowd erupted when the final skier, from France, got his score placing him in 6th, and it was confirmed that Canada had earned its first gold on its home soil. Afterwards, we got in the car and headed home. We took a rural back road to a smaller border crossing without any lines. We made it home around 10:30, exhausted but still with the glow of Olympic fever. As I mentioned in the previous post, I wanted to buy books from the Twilight series for Seattle area charities, specifically those who were helping women and children. I was able to get 40 books — 10 complete Twilight Saga sets — to give away and found five great organizations to give the books to. Seattle Indian Center provides day programs for Seattle area teenagers. It offers a job placement program for adults among many other services in Seattle's diverse International District. 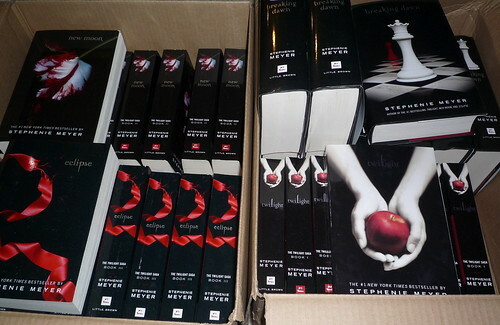 Seattle Indian Center received two sets of the Twilight Saga for their library. Each of the centers were really excited to get the books and I'm hopeful that they'll be put to good use. More about the apps can be found at the support page. To market New Moon Countdown, I've decided to give a book from the Twilight saga to a women and children's center, school, or library in the Seattle metro area for every 100 downloads of the app through iTunes before July 31th. These books have brought a lot of joy to young women and I hope that this will get books into the hands of people who may not have been able to read them otherwise.